Once upon a time, Apple made the first PDA. Irefer to the Newton MessagePad, ofcourse. Istill have a couple of old MessagePad2100s in my bag of useful (and probably useless) cords,accessories, and flotsam and jetsam. The Newton was conceived in thenon-Jobs era of Apple, and Steve Jobskilled it as soon as he came back. I don't use the MessagePad now; my iPod touch has replaced it as my"mobile device". However, like many other Apple products, the Newtonwas ahead of its time. It could sync contacts, calendars, and notesfrom your desktop to a small handheld device with a touch screen. Ifound that it was great for note taking, since I could draw (helpfulfor math, science, or art) and write on the same note! Theoptional keyboard was tiny, but I found it usable. The MessagePad hadroom for two PCMIA cards and can be adapted for a wireless card. The Newton OSwas a separate operating system that used the same database (called a"heap") for several different applications. Another use that I found for the MessagePad was as a mobile datacollection device. Compared to the Palm devices at the time, the Newtonwas easy to use to update your contacts. It was easy to fill in fieldswith the stylus, and the shared database would offer suggestions (indrop down boxes) for addresses and such. Of course, when the iPod touch came along, it blew the Newton intothe bushes in terms of size, color display, and compatibility withOS X. (The Newton user community has done yeoman work to sync theNewt with OS X, but I found that the applications I used withOS X 10.4 "Tiger" crashedand took forever to use. Besides, I could see that the future was with the iPod touch. Are there things that I miss about the Newton MessagePad? Yeah. Imiss the larger screen size and the physical keyboard. This brings me to the new Apple iPad.It addresses several needs that I feel the Touch can't deliver on. For one thing, the iPod touch can show movies, but that tinyscreen makes it more of a chore than my over-fifty eyes need. I likecarrying around an Internet browser in my pocket, but since I frequentwebsites with large text content (like Low End Mac), extended browsingis tiring. I definitely lust after more screen real estate. Of course, I use the iPod touch for email, but for typing an articlelike this - no way. 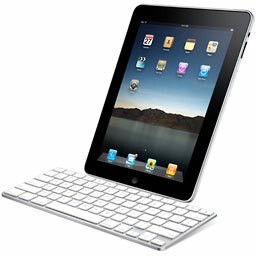 I am intrigued by the iPad's built in keyboard,iWork apps, and dock (with it's full size keyboard!). I can picturemyself on the dock of my uncle's lake cabin, typing out my latestmissive for Low End Mac! Don't worry, I'm not rushing out to buy one just yet. Frankly, myiPod touch is the first iPod I'm ever owned. I used to use my MotorolaRazor to listen to my digital music on the go. I waited on Apple toproduce an iPod with a browser, and Steve Jobs listened to mydreams. I had no idea that he was still listening and would produce theiPad. I want to touch one and see if it is usable. I'm not sure that it isa netbook replacement, but I also feel that we need to wait and seewhat the future holds for the iPad. Does everyone remember that the first iPod looked like? Doeseveryone remember how many pundits panned the iPod? I feel that the iPad will show that Apple and Jobs have made anothergame changer.